Comment Best-selling author Malcolm Gladwell had a powerful impact on the way climate change was marketed to the public, without even knowing it. 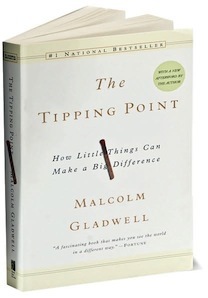 Gladwell's marketing book, published in 2000, embedded the phrase "tipping point" into the public's imagination, and this in turn was used to raise the urgency of climate change. It seems ridiculous today, with climate sensitivity models being tuned downwards, natural variability recognised as increasingly important, and climate institutions talking about a period of long-term cooling. Much of the urgency went out of the window after countries failed to agree on a successor to the Kyoto agreement at Copenhagen in 2009, and the costs and taxes of "low carbon" strategies are political poison. But back in the mid-noughties, it was very different. The idea that the climate was reaching a "tipping point", and that global temperature would runaway uncontrollably, was rife. It created a sense of urgency that helped pass legislation such as the UK's Climate Change Act in 2008. This story emerges from the FOIA2011 archive – the so-called Climategate 2.0 emails released last week. Although it hasn't had the immediate and dramatic impact of the first leak two years ago, the breadth of social networks uncovered in these emails will keep historians busy for years – and whets the appetite for the 95 per cent of UEA emails still under wraps. The idea of climatic tipping points is fascinating for several reasons. The question of whether ecosystems are inherently stable – or unstable – preoccupied biologists for much of the last century – and was the subject of Adam Curtis's film The Use and Abuse of Vegetational Concepts, in a BBC series for which I was assistant producer, and which Curtis summarised here. Fashions change, and so do myths. Arthur Tansley, who invented the word "ecosystem", believed in "the great universal law of equilibrium", and this was pursued for decades. Today, the idea that ecosystems are delicate and unstable instead dominates. The idea also divides scientists. Geologists, for example, point to evidence of long-term cycles, and stress continuity and predictability. For example, we roughly know how long interglacial periods last – we're in one now, which is due to end fairly soon. And the idea also divides us. If you are of the view that mankind is a disturbance to a natural order, you're much more likely to believe in runaway effects. If you're of the view that nature is here to be tamed for our benefit – an idea born out of the Enlightenment – you're more likely not to panic. In 2000, New Yorker journalist Malcolm Gladwell published a mish-mash of ideas that nevertheless spawned a buzzword. Gladwell found a common metaphor that could describe – but importantly, not quite convincingly explain – things as different as the spread of diseases, social behaviour (crime waves) and best-selling products. The phrase "tipping point" was everywhere. Both Gladwell and Tansley were really making grand, metaphorical generalisations. Gladwell borrowed his idea from epidemiology, Tansley from the idea of the human brain as an electrical circuit. Both became universal "theories of everything". Into our story comes the magnificent Hans Joachim "John" Schellnhuber CBE, a German physicist and social networker, whose stratospherically high opinion of himself is not, it seems, shared by the climate scientists at the University of East Anglia. Today Schellnhuber is climate change advisor to the president of the EU Commission, and boasts of regular chats with Chancellor Merkel. He was a climate advisor to Tony Blair. By the late 1990s Schellnhuber was a powerful and influential figure. 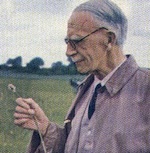 Having founded the Potsdam climate research institute he was able to influence the establishment of a UK equivalent, the Tyndall Centre, and UEA was bidding to host it. On his blog, Andrew Montford relates the tale of how Schellnhuber helped hand the Tyndall award to UEA, then took a post as its research director. This was a full-time job, but Schellnhuber concurrently held a full-time job at Potsdam – leading to incredulity from his new colleagues at UEA. "Even a very competent person could not possibly hold down two responsible, full-time jobs like this," writes former CRU director Tom Wigley, in amazement. Schellnhuber had become fascinated by complex systems and non-linearity, particularly the work coming out of the New Age-y Santa Fe Institute. (He formally joined the Institute last year.) This was deeply influential. What he saw terrified him: a world out of control. Let this hagiographic profile of Schellnhuber pick up the tale. "After many successful, and some failed, attempts to explain climate change to political leaders and CEOs, Schellnhuber has a good sense of what works and what does not. As the lead author of the chapter on 'large-scale discontinuities' in the third report produced by the IPCC, he used the phrase 'tipping point', which has wide currency in the business world," we learn. “In a conversation with a BBC journalist, I said ‘these are, more or less, tipping points’ [in climate change]. He immediately understood," Schellnhuber told his profiler. Schellnhuber capitalised on this with a paper, Tipping Elements in the Earth's Climate System co-authored with several others. Despite its speculative nature – "subsystems indicated could exhibit threshold-type behavior in response to anthropogenic climate forcing", we learn. It has been cited over 500 times. Amongst the subsystems discussed are the Arctic sea ice, which could take 10 years to disappear, the collapse of the Gulf Stream (10 years), and the greening of the Sahara Desert (10 years). None look likely today, with global temperatures fairly static (or falling slightly – depending on how you fit the curve) for 15 years. It was a deeply pessimistic point of view. But Schellnhuber welcomed the climate apocalypse, because he saw human beings as the planet's enemy – and the planet must come before human life. 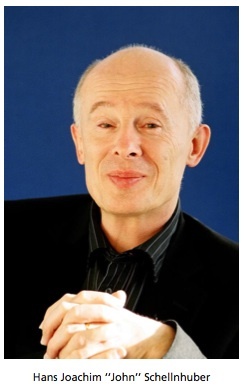 “In a very cynical way, it’s a triumph for science because at last we have stabilised something – namely the estimates for the carrying capacity of the planet, namely below 1 billion people,” Schellnhuber told a conference in March 2009. Such a neo-Malthusian vision could only be turned into reality with unprecedented coercion and repression. Earlier I referred to two competing views of the relationship between man and nature: the enlightenment view of optimism, of taming nature (and looking after it responsibly), and man as a destroyer. Schellnhuber's pessimism belong firmly in the latter school, and that's the view that's dominated policy-making for 40 years. There's a problem, in that it isn't one shared that's by the public; few parents or grandparents pray for their offspring to be worse off, or more less free. There is little doubting Schellnhuber's success both as a social networker and an influencer. At the height of the climate panic a few years ago, the sense of urgency became all encompassing, and convinced politicians and the media that these were extraordinary times, requiring extraordinary measures.